We all know who Murt is by now. I reblogged a post by The Levi Page, and got a rambling incoherent answer whinning about everyone being out to get him. He claims Michelle, Holly, Prinnie and most of all, his current nemisis RadioNewz Blog are all trying to frame him for missing child Haleigh Cummings. Does he honestly believe RadioNewz (who’s from Georgia) kidnapped a child in Florida 5 years ago? He has even gone as far as contacting the FBI in Florida! William Murtaugh a/k/a Murt, is no stranger to the internet true crime world. 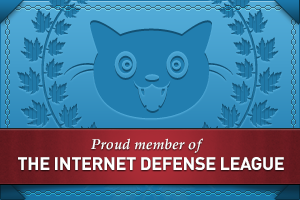 He is a known troll that is banned from crime forums such as Websleuths, and InSession. 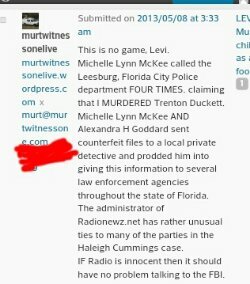 Murt started blogging during the 2006 case of missing Florida child Trenton Duckett and ever since then he has been engaging in sleazy behavior. What is most disgusting about Murt is that he often uses missing and murdered children and inserts himself into their case in order to get attention. While blogging on the Trenton Duckett case, Murt used disgusting, attention seeking antics. Murt would show up on several blogs and forums claiming that on a certain date something “big” was going to happen. He made it seem like he was close to law enforcement and had inside sources. He would even “count down” the days… Well his bombshell turned out to be a dud and nothing happened. It was just typical sleazy Murt using a missing child case to get attention. Now Murt is at it again. This time he is inserting himself into the case of murdered Satsuma, Florida girl Haleigh Cummings. 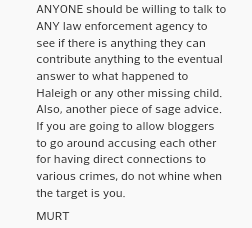 Murt has accused a satire blogger that resides in Atlanta, GA of abducting the child. Why? Because this blogger often publishes satirical content about him. How disgusting is that? Using a child that law enforcement says is a murder victim, and claiming a blogger that lives in a completely different state than where the child went missing, abducted her. 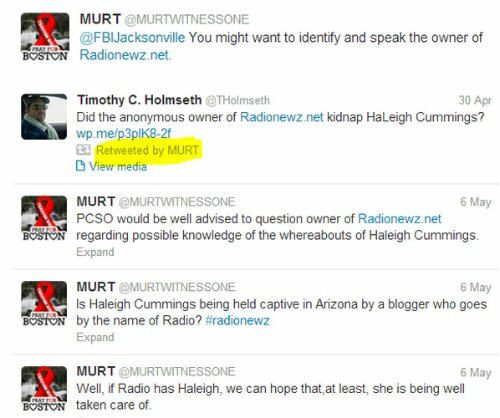 Murt has even tweeted the FBI office in Jacksonville asking them to investigate RadioNewz.net. You are a troll that needs to be involuntarily committed. Get off the internet and seek psychological help, because you are in desperate need of it.